I do not plan on using this in a humid environment, however, If you are filling a tank, do you need to periodically turn it off to expel any water? You actually don't need to turn it off to do that. I just open the bleed valve on the compressor every 15-20 minutes. Just a quick shot to bleed any build up then close it quickly. Really simple. what do I need to use for scuba tanks for breathing air. do you sell the correct filters ? the output of this unit does not seem that much more than the much smaller Nomad unit. What are you getting for basically double the price tag and a much larger unit? This compressor can fill your large tanks (that's really what it is meant for) the Nomad units are for guns only. This also fills considerably faster than the Nomad would if used on the same gun. Will this compressor fill pcps and scba or scuba tanks? Will this work at higher elevations? I live at 8400 ft altitude. When I get to over 3000psi it starts making a different noise and getting louder the first fill didn't do that is this normal? The description says this compressor can do it all, even SCUBA tanks. It also says not for breathing air. I must be missing something here. Anyone have clarification? Lots of people use SCUBA tanks to fill their PCP airguns, not necessarily for diving purposes. I will have to use a 25ft extension cord with 110vol. What size should I use? Example: 25ft 12 gauge, 15Amp, 240 vol. This compressor is rated as drawing 15 amps. This is the same draw as you might have with a table saw. According to the Home Depot website, you would want a 25 foot extension cord to be at least 14 gauge. It wouldn't hurt to go heavier, to like a 12 gauge, but you would not want to go to a lighter gauge. I will have to use an extension cord with the compressor of 20 to 25ft. What size cord should I use? Examp: 25ft 12 gauge 20 Amp 240Vol. who is the actuak manufacturer of this compressor , and are the cylinders aluminum with plated cylinder internals ? I have purchased the large 4500psi Venturi Air Compessor and found a disconnected wire(yellow/green stripe) after removing power panel. Is this the ground wire? It goes to the third post on the power outlet. Will this connect to a Benjamin armada? As to previous question, the concern is not just the smell of the air, but that there is excess oil in the air and may have deleterious effect on seals. We have Pardini competition pistols and other air rifles. Is the oil a problem for the seals? Or is this not of concern? Manual says to use 5w-40 motor oil. Others have stated to use synthetic oil or ISO100 compressor oil. Any risk of damage to seals by these oils? I can say that I have not seen any signs of damage in my guns that I fill directly from the compressor. No moisture inside of them. I use a synthetic compressor oil. After setup and break-in period, I have filled 3 tanks. However, our airgun coach is concerned because the air coming from tanks have an oil smell. The filter has some oiliness to it, mostly at bottom 1/4 of it. Concern is that this oil, if petroleum based, will degrade the delicate seals of our air pistols. Is this a valid concern? The scuba shop air is always clean and odorless. Anyone have an issue or concern with this? It's not an issue, if the smell really bothers you, you can add a filter with activated carbon to remove the smell. Scuba (breathing air) compressors have this built into their filtration systems, which is one of the reasons they are breathing air safe. The Air Venturi compressor does not have this element and is not breathing air safe. I would recommend running synthetic oil in the compressor, it will last a bit longer. does this have a moisture filter included? Can Royal Purple Synfilm Recip. 100 Air Compressor Oil be used in this unit? Can this be an option for the 5W40 oil that goes in the compressor? This is synthetic compressor oil not an anti-freeze. Thanks Tyler for the quick response to my first question. Sorry Greg, missed that part. Yes, synthetic compressor oil is perfectly fine. Can Royal Purple Synfilm Recip. 100 Air Compressor Oil be used in this unit? A ton of different fill speeds with varying volumes and pressures.. I want to know if mine is pacing with the rest. Can we set the speed standard: Fill time of a stock plugged hose @4500psi? It is just a diagnostic question. I just tested mine 1 minute 30 seconds. I know it isn't simple math but with these numbers just to fill the hose some of the tank top off numbers are magical. It will vary a little for each unit but shouldn't be too far off. Mine fills the hose to 4500 in about 1 minute and 40 seconds. Does this compressor have a way to keep moisture from getting into your air gun, or does that have to be added later. Can an inverter be used with this compressor and if so what amperage an voltage are required? Dose this compressor have a moister extractor built in unit? It does not have a "dryer" if that is what you mean. The output filter on the high pressure side acts as a moisture catch. But it does not have a desiccant filled dryer/filter. What are piston seals made from? PTFE, metal, o-rings? I'm asking because i've heard different answers to this. How many stages is the AV compressor? Is oil smell normal while operating? I did the proper 10 minute break in. Then I filled a 96 cu ft carbon tank. Temperature was good, oil level good. I stopped at an hour to let everything cool down. I believe I was at 3500 psi, then took about another 15 minutes to get to 4500 psi. What if you over fill the oil? Instead of at the line indicated in the manual, it is about a 1/4" above it. Should I leave it or try to drain the excess? Shouldn't be an issue to be above the line. Just don't want to be below it or spilling out of the top of the fill hole. the connector is it 8mm? I live in a high humidity area and am wondering if the output compressed air will be sufficiently dry to use in my rifles as is, or is and additional moisture filter recommended? If an additional moisture or desiccant filter is suggested, which ones do you recommend? If you use the compressor inside where there is AC, you shouldn't have an issue. That said, outside where it is taking in humid air, a dryer or secondary filter would be a good idea. There are many good options out there. I've read all the Q&A about moisture filtration. Had anyone inspected a tank after many refills for condensation on the interior? I just yesterday emptied 2 tanks and remove valves no moisture so I removed the 2 pipes that keeps trash and moisture from leaving tank and messing up a breather for instance. Put the valve back on and refilled the tanks and turned them over and opened the valves ever so slowly to see if there was any moisture in the tank, None came out. The ambient temp was 96 and humidity was 95, very impressive. Recently purchased Hatsan AT44W-10 Long and Air Venturi compressor. Everything works fine but the air pressure gage on the AT44 and the compressor don't track. I have to set the cutoff on the compressor to 220 bar for the gage on the AT44 to indicate 200 bar. Which one is more accurate? No telling. The tiny gages on air rifles are not terribly accurate, but I'd play it safe and let the higher number dictate. How is the compressor with keeping moisture out of our pcp rifles? The filter on the compressor by itself will not dry the air but will pull out physical liquid before it gets to the output hose. Does the compressor have a replacable intake air filter and if so are they available and how much are they? It is replaceable, you'd have to contact the tech team at PA to see if that part is readily available. This is a stand alone unit, so it takes ambient air and compresses it. How many liters about the integrated water tank(white colour one), and how many minutes does this compressor charge 6.8L air cylinder from 0---4500PSI continuous without stop? Thank you. The water tank uses about 4.8L. And the compressor will charge that size tank in about an hour. If the bottle is 6.8L. Can you charge it from 0 psi-4500psi without stop at one time? how many times it used? and the internal water will be hot or not? Yes. Not sure what you mean by the second question. The water temp does not rise much. Does this compressor has a self contained internal water cooled system? If so, does it can fill 6.8L air tank at one time and didnt turn off the comprssor. or it needed External water source to finish 6.8L at one time? Yes it is internally water cooled. And yes, it can fill that size tank in one attempt without stopping. Nothing needed. The Royale has a male QD fitting, the end of the hose on the compressor is a female. You'd be able to snap it right on. Normal operating pressure as we were testing them was around 75C. We had a few units go a little above this but no more than 5-7C. That's typically only when filling larger bottles. The only time I've seen one go over 80C was when we checked to see how hot it will get with one of the pre-production units without water. That unit went over 95C. There is a shut off built in that should stop the compressor if it goes above 95C. Thanks for for your help! Again, thank you for your help, appreciated! can this compressor be plugged in any 110v house outlet or does it required a certain amp rating? i saw that Tom Gaylord in his review stated he had his plugged in a 20 amp household outlet. will it work on a 15 amp household outlets. Also is the Compressor UL or ANSI approved? Yes it will work in a 15 amp outlet. And no, it is not UL or ANSI certified. can I use royal purple ice it is not a antifreeze? it is a cooling system optimizer and a conditioner. Should not be an issue to use either with straight water or a water/anti-freeze mix. I may have missed it, but where can I get replacement filters for this compressor? What freight company are they using for shipping. Freight companies charge extra for delivery to residential addresses unless the shipper has those charges waived in the contract. It may be advantageous to pick it up at the local freight terminal. Pyramyd Air does not charge anything extra for shipping it via freight. Some shipments are done via freight and some via regular FedEx. If you were to use synthetic oil, which grade would you use and can you use purple ice in the water with antifreeze to run cooler? 5w40 would still be fine and yes, antifreeze can be added/used for coolant. Scanning the online manual, I see oil change intervals, startup instructions, and troubleshooting advice. Two questions that I see asked but not answered below or in the manual are, 1- Output in CFM or CFH, and 2- rebuild interval. Thanks. Output is about 1.5 CFM. As far as rebuild interval, we have yet to come to a point where rebuilds are necessary for the compressors that we have been long term testing. And outside of the filter and oil changes, we have yet to see any change from initial performance on a compressor with over 50 hours of use. what are the piston rings made of ? Can this be used as an air supply for home shop air tank as well as a filler for pcp tanks? Would be nice to be able to double duty this little gem. The output on this compressor is 3,000 PSI+, home shop air tanks would not be safe to fill from this compressor. I am new to pcp. Can I fill an air gun right from this compressor? Or do I have to fill a tank and then fill the air gun from the tank? You can fill the gun from this compressor. I would also like to give Tyler a thumbs-up! It's mostly water that is expelled when the compressor is bled but yes, there can be oil mixed in with that as well. That said, in terms of travel, any oil (or water even) comes into the filter tube at the bottom. The majority drops right into the catch that is located directly where the bleed screw is. The liquid that passes through that area goes through a steel wool like catch and then up into the filter. The filter is 7" long and 1.5" in diameter. Not only would any liquid have to make it past that, but it is fighting gravity while doing so. Only after all of that would it make it into the output hose that is connected to your tank/gun. The filter would have to be significantly saturated (basically in need of replacement) for liquid to make it past it. That's the reason you are given a replacement and also the reason why the manual shows you how to replace it. So is it possible for oil or water to make it through?? Yes...but only if you skip out on the necessary filter changes. Just like your car or truck, if you skip out on your preventative maintenance (in this case oil/oil filter changes), you're not going to be pleased with the results. So replace the filter at the suggested intervals (or sooner if it makes you more comfortable) and you'll be A-OK! Can you use antifreeze in the cooling system? Will the air be safe to use it for Scuba purposes? I would guess there would be oil in the compressed air so you could never again use the tank for scuba after using this. True? This compressor does not produce breathing quality air. Where does it pick up the temperature? Where is the temperature taken? Can you use synthetic oil instead of 5w40 regular oil and does it need antifreeze and or purple ice. Does not need anti-freeze but you can use it without issue. Synthetic oil has not been tested but should not pose a problem. Is it setup to produce dry air from the compressor to supply tank or is it highly recommended to put a desiccant system between compressor and tank being filled. There is an intake filter and an output filter in the compressor to dry the air. It can't hurt to put a desiccant filter between the compressor and device you are filling, but it is not necessary. Airgun depot lists the weight as 84 pounds. What is the actual weight of this unit? 76 lbs, measured without oil and water. Curious if Air Venturi offers maintenance/rebuild kits for those of us inclined and capable of doing our own work. Sure like to avoid shipping a unit back East for paint or repairs! Thnx in advance! Extra parts will be available, yes. What is the largest tank that this will fill? The largest that has been tested with it has been a 98 cu ft, 4500 psi tank. I would imagine it could fill larger 4500 psi tanks, but I would recommend letting the compressor cool (stop and bleed it) if you run it for more than 1.25 hrs. I noticed your address is in Cleveland Ohio would I be able to purchase the compressor directly from this location or is this where I would take the compressor for repairs if ever needed. You can place your order over the phone and request a local pick up. Will pyramydair be set up to makes repairs on compressor if needed . Does this compressor have an air-water separator? Does this compressor have a water filter? On the intake - yes. Does the compressor have a moisture trap or filter? does it need a second compressor like the shoe box? Does the air filter contain a desiccant? It does not have a desiccant filter. It has filters on both the intake and output but they are not desiccant filters. Anyone have any idea how many amps this draws at what wattage? Fairly quiet. You can have a conversation while it's running. What is the output CFH? What is the noise level in DB? Very much looking forward to Tom Gaylord's review! How is this any different than a standard garage compressor? Could anyone tell me about the air filter/humidity protection of this unit? Will additional filters be available? Power requirements (amps) at 110V AC? I thought it was a oil fee pump only?? How easy is it to rebuild and how many hours between rebuilds. Do you need a external compressor also ? Will maintenance and repair parts be made available to the customer. 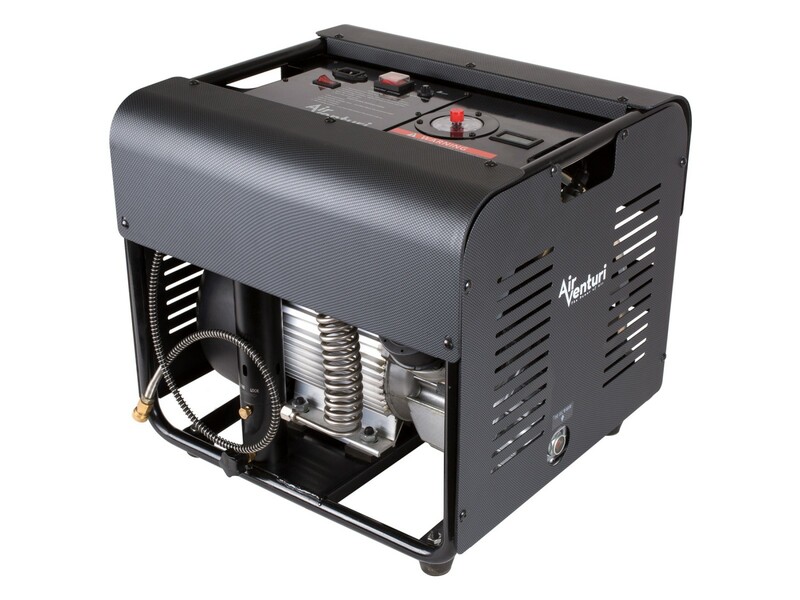 Several compressors which were sold previously did not offer maintenance and repair parts (swedish compressors). So when the compressor stopped working there were no repair or maintenance parts available. Yes, parts will be available. Does it have a moisture filter? There is on the air intake. How often does it have to be rebuilt? Is it user serviceable? Thanks! Does this compressor have a moisture filter, if not, can one be added as an aftermarket item? Yes, has a moisture filter and yes more can be added. Isn't this the same as the Chinese compressors I see on Alibaba all the time or under $350 delivered to the US - with a different shell and Air Venturi logo? Is this what meant by "gross profits"? No, completely different (although does look similar). Not to mention support you will get from the USA company. How loud will this be; e.g., in a basement or garage vs. outside? It's fairly quiet. You can have a conversation while it's running (much quieter than a regular shop compressor).